Megan is in Austin and is a budding musician. I'm 15 and a sophmore in high school, it's really exciting. This year is gonna be a good year for me, I can feel it. I've been interesting in modeling since I started watching America's Next Top Model and seeing all the girls get all dressed up and wacked out with make-up. And getting behind a camera to take gorgeous pictures, it made me want to be a part of that world. I'm not in a band but I played in middle school band, as a percussion player. I'm not in high school band, but I still play the drums. Me and some of my friends are semi-working on getting a band together. My favorite part would have to be getting ready for a shoot, getting my hair and make-up done and wearing cool clothing. And meeting new people! Favorite models or fashion magazines? My favorite model would have to be Heidi Klum. She is just so beautiful and talented and has had a modeling career for a long time. It would be really cool to meet her and get a few pointers from her about the modeling business. Magizine wise I never really read mags, I was more of a book worm, so I really don't have a favorite mag. Hey, even Adriana is doing it! A Lima in the new Givenchy campaign. Our newest Wallflower is, well, hardly a wallflower. 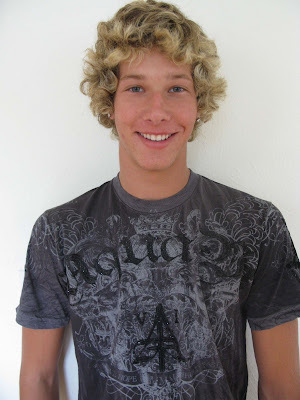 The curly-haired golden boy is 17 and a senior in high school. The final results are coming soon. Stay tuned to see how our little wallflower will blossom!